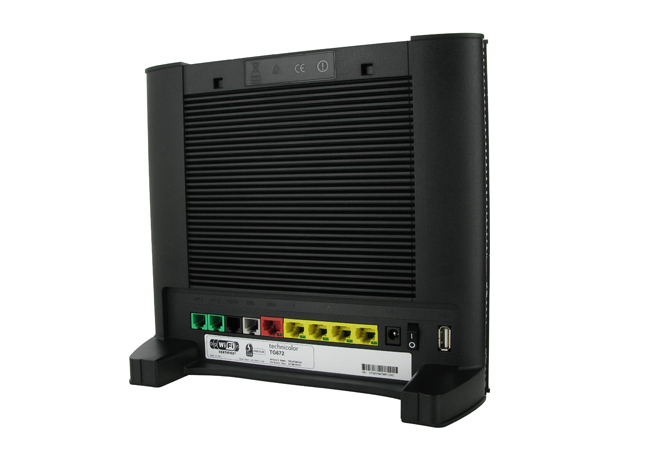 Customers using a Gradwell Fibreline (FTTP) service have the option to purchase a Technicolor TG672. This router will self-provision when first setup, minimising the configuration you need to perform to start using the service. To install the router you need to perform the following simple steps. When the Fibreline service is installed a network termination unit will be setup on the circuit (this is managed by Gradwell and no access is provided to this unit). The Ethernet port on the rear of this unit is the demarcation point for the service. Connect the red Ethernet cable to this Ethernet port.Connect the other end of the red Ethernet cable to the red socket marked WAN on the rear of the TG672. If you wish to connect a computer directly into the TG672, connect the yellow Ethernet cable to your PC, and the other end of the cable to the Ethernet socket marked 1 on the rear of the TG672. This will ensure the PC is always protected by the NAT firewall, even if our mixed mode template is loaded. Plug in the power supply and turn on the router. Once the router is connected and turned on, it will automatically start configuring in the background. This should only take around five minutes. Once configuration is complete, your Technicolor router will illuminate both the Broadband and Internet lights as solid green. Wait 5 more minutes and then your router will be fully configured and ready for use. Please note - you will be left with a grey broadband cable and a microfilter - these are not required. You will find information regarding the wireless network settings on the back of the router just below the yellow Ethernet sockets. Port 1 is a 10/100/1000 port. Ports 2 to 4 are 10/100 ports. Port 4 is also used as a diagnostic port. If you are having problems setting up the Technicolor TG672, ensure that all cables are correctly connected and reboot the router. If the Internet light still fails to turn green after 5-10 minutes, please contact or customer services team for assistance.